Marketing Strategy Musings - Strategy Dude (Edmund Wong's blog): Who is the Most Engaging Luxury Auto Brand on Facebook? Who is the Most Engaging Luxury Auto Brand on Facebook? The auto industry is selling cars like hotcakes this year! The luxury segment is no exception. While BMW, Mercedes, Lexus, and Audi continue to duke it out in the dealerships for the crown of top selling luxury auto brand in the US, let's take a look at who's king in social media. Using social media analytics tool Quintly, I set out to see how engaging each of these 4 auto makers were on Facebook. First off, Audi has 9.5 million fans, more than double its closest competitor, Mercedes with 4.2 million. Lexus and BMW round out the pack with 3.5 million and 2.1 million, respectively. The 4 brands have been growing their fan base in a similar pattern this year, surprisingly all at about 1.5-2.0 million range. What's interesting is despite posting on the lower end of the 4 brands (301), Audi saw about twice as many posts from its users than the other 3 brands (5,297). But there is more to this story. The interaction rate (or I-Rate) provides an index of user likes, shares, and comments from a brand's post. Mercedes has the highest interaction rate (0.44%) and surprisingly Audi has the lowest by a wide margin (0.13%). Over the course of a year, Mercedes started strong and maintains a decent I-rate for rest of year albeit slightly lower. BMW is very erratic, while Lexus and Audi are relatively stable. When analyzing the Interaction Rate by Post Type, Photos tend to generate the most engagement. That comes as no surprise to most social media marketers. What's amazing is how high the interaction rate is for status updates from Mercedes (as shown on the left below). In the spirit of all the awards shows on TV this time of year, now let's turn to some of the categories for the Most Engaging Luxury Auto Brand Awards to understand what's behind these numbers. Most Likes for a Post: Mercedes-Benz The #MBSummer post below had over 118K Likes. What made this wildly successful was how the same hashtag was spread across Twitter, Pinterest, Instagram, and Tumblr in a massive #MBSummer campaign, encouraging Mercedes enthusiasts to post photos of their cars. Great job on cross-channel marketing! In fact, Mercedes owned the Top 5 Most Liked Posts in 2014. That helps explain its high interaction rate for 2014. 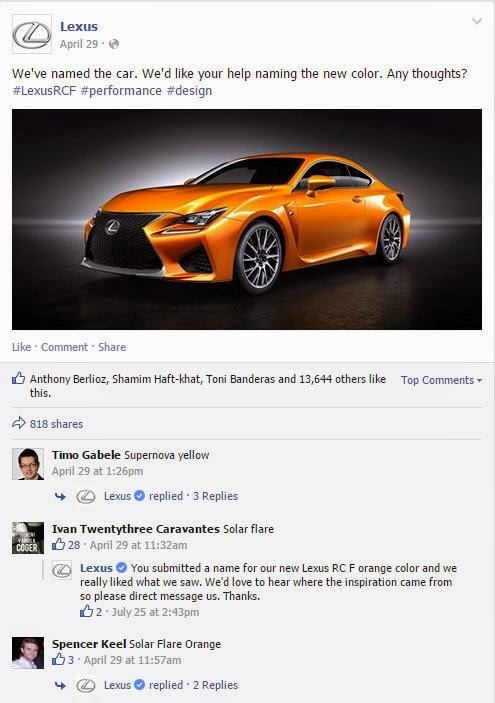 Most Comments for a Post: Lexus In April, Lexus generated over 2,500 Comments from fans when it turned to them to name the color of its new 450-hp RC F. This post also garnered over 13K Likes. And the winning color name was...Solar Flare. 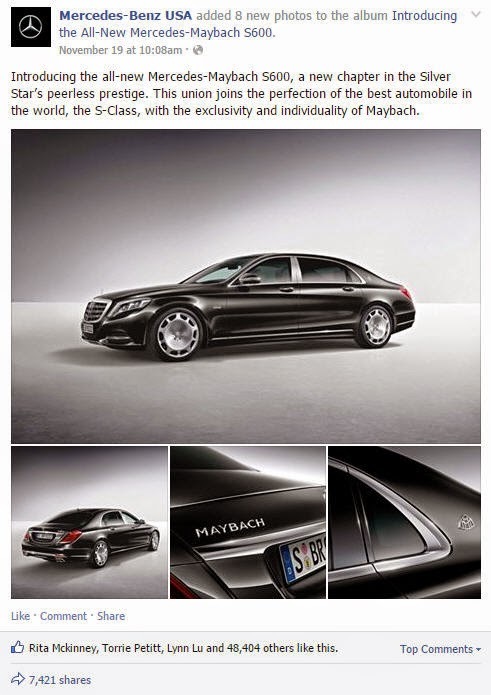 Most Shared Post: Mercedes Last month, Mercedes' unveiling of the new Maybach 600 had over 7400 Shares. It also didn't do too shabby on other engagement metrics with 48K Likes and nearly 1600 Comments! So who's the Most Engaging Luxury Auto Brand? Envelope please... I would have to say Mercedes is the most engaging luxury auto brand on Facebook this year. It's higher Interaction Rate (0.44%), highly driven by its engaging status updates, left the others in the dust!